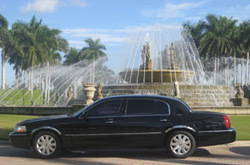 Go Platinum Transportation, formerly Platinum Limousine, has been providing luxury limo service and airport transportation since 1994 in the Fort Myers, Bonita Springs and Naples Area. 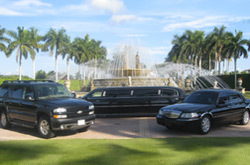 Our company offers prompt, luxurious, chauffeured transportation service in Southwest Florida. Our staff and chauffeurs are highly trained and knowledgeable. Use our services for airport transportation, personal travel, corporate groups, meeting and events, wedding service with dove release or a night on the town with our limousine service in Naples, limousine service in Bonita springs, and limousine service in Fort Myers. With the top-of-the-line vehicles and professionally trained chauffeurs you are guaranteed an excellent experience from the first phone call until you arrive at your destination. We look forward to providing service to you in Southwest Florida and around the world for any transportation needs! Lincoln L-Series Town Car seats up to 3 passengers and 5 pieces of luggage. Our luxurious sedans have an extended 6 inches for extra rear leg room. Lincoln Town Cars have black exterior and soft leather interior. Sport Utility SUV seats up to 6 passengers and 8 pieces of luggage. Our SUV’S are black exterior and leather interior with bucket seats. Our Passenger Vans seat up to 12 passengers and 12 pieces of luggage. This is an efficient way to travel. Seating may vary with luggage requirements. 120” Lincoln Stretch Limousine seats up to 8 to 10 passengers and 6 pieces of luggage. Our luxury limousines come in black or white exteriors and black leather interiors. The stretch limousine is the way to travel in style or to celebrate a special occasion. They are stocked with many amenities: decanter and drinking glasses, mood lighting, optional stocked bar, privacy divider, TV with DVD player, premium stereo sound system with CD player. Minibus seats up to 32 passengers and a comfortable ride with even more leg room than our other vehicles. Amenities include: a premium stereo sound system with CD player, TV with DVD player (available in some vehicles), high-back chairs with armrests and delightfully tall and wide windows for outside viewing. Additionally, our minibuses offer extensive luggage capacity. Minibus comes with white or black exterior with cloth bucket seats. Available upon request. Motor coaches seat up to 55 passengers with up to 60 pieces of luggage. Motor coaches have classic white exteriors, cloth interiors, with center aisle, comfortable bucket seating, PA system, TV, DVD player and on-board restroom. We provide a luxury, chauffeured livery service, whether you need transportation for an executive, client, or for yourself, we can service you in style, with chauffeurs that are knowledgeable and dedicated to your particular needs. Our drivers are prompt arriving at every pick up 15 minutes early. We provide private, chauffeured airport transportation, with a wide range of vehicles to fit your needs. We track the progress of every flight, commercial or private aviation. No matter what time your flight lands, your vehicle and chauffeur will be waiting for you. From one passenger to hundreds, we can accommodate you needs. For convenience, we can provide a direct billing account or a credit card account for future bookings. All invoicing can be customized to fit your request. Our meeting and events department can help manage all aspects of group transportation. With our trained professionals we can help manage your manifest, provide an on-site coordinator, and guarantee your transportation will be headache free and a success. We understand the importance to detail and the high-quality level of service corporate clients demand. We can service any size group and will maintain that level of service for your clients and staff. Travel for tours, activities, meetings, leisure, black tie event, or an evening on the town in our top-of-the-line, chauffeur driven vehicles. Travel for any occasion, from a small group to a large group, we have equipment to meet your needs. Use our luxury limousines that have a privacy window to ensure total confidentiality, should this be required. We can provide transportation to/from sporting events, prom, dinner, concerts, night-on-the-town, bachelor and bachelorette party, wedding, as well as any appointment. Want a luxury transportation service, but only need a pick up and drop off service? We have a more economical service to fit your needs. This service is designed to pick you up at Point A and drop you off at Point B, with no stops in between. To ensure availability we ask for reservations to be made at least two hours prior to your pick up time. Pricing is based on a flat transfer rate. However, please note wait time and stop fees will apply, when applicable. Black-out dates may apply. Enjoy your wedding day in style, add this package to your service and you will receive a "Just Married" banner, balloons, and non-alcoholic champagne. Red carpet is available as well. Celebrate your anniversary with the love of your life in style, add this package to your service and you will receive a "Happy Anniversary" banner, balloons, and bouquet of flowers. Celebrate your birthday in style, add this package to your service and receive a "Happy Birthday" banner, balloons, a box of chocolates and bouquet of flowers. We will offer special holiday packages for Christmas “Tour of the Lights” and Valentine’s Day. Tour of the Lights Package: Available the month of December, comes with egg nog, Christmas music CD, and a tour of the holiday lights. Valentine's Day Package: Available the month of February, comes with a romantic box of chocolates and a bouquet of flowers. “We are large enough to service you, but small enough to care”. Our company is owned and managed by staff that has 20 years of combined experience in the transportation industry. Our drivers are trained to perfection, undergo background check and drug screening every year. Every client of Go Platinum Transportation is a VIP, from a private individual, to a corporate executive we understand your high-end level of service expectations. We will provide prompt, professional service that allows you to relax and enjoy your ride. We will deliver you in comfort and style as we understand, “It’s more than a ride in a car”. Go Platinum Transportation will service you with pride, knowing that we have experienced staff, with high goals and intentions of meeting your needs.